24 февраля 1940г. : первый полет под управлением Филиппа Лукаса выполнил прототип истребителя Hawker Typhoon. 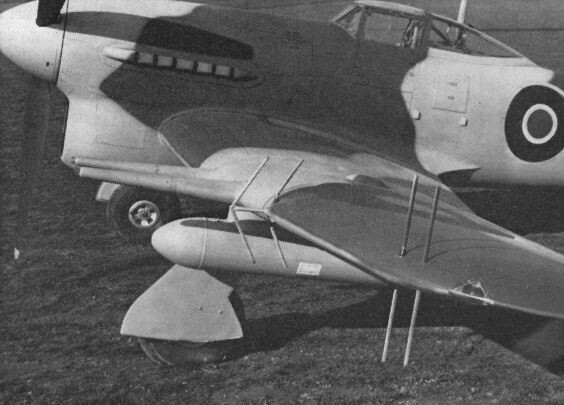 The Typhoon prototype P5212 in original form with small rudder and no inner wheel covers. Two views of the same prototype after modification to have extra cockpit windows, larger rudder, inner wheel covers attached to the leg fairings, aerial mast and revised finish and markings. The view on the left (also showing the temporary tail-wheel doors) is one of a series taken at Boscombe Down in October 1940; other views in this series previously published elsewhere have been incorrectly identified as the second prototype. Note how the use of orthohromatic film has caused an apparent reversal of colour tones; the finish is the same in both illustrations. 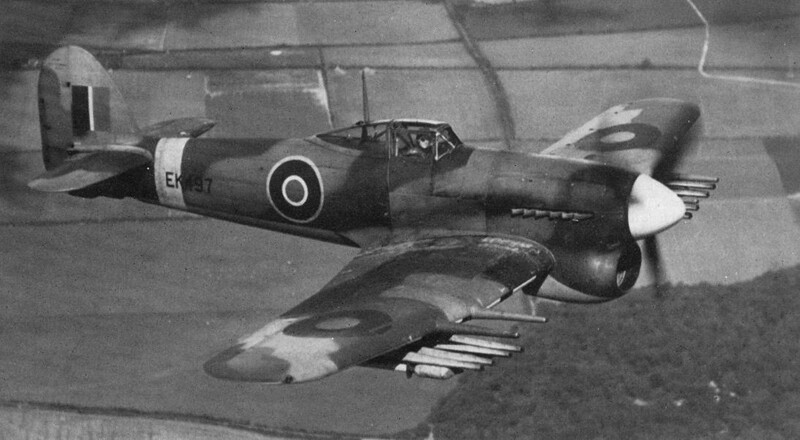 The second prototype Typhoon, which had inner wheel fairing doors relocated on the fuselage and was the first to fly with four-cannon armament. An early production Typhoon IA. The interim production standard Mk IB with early style cockpit canopy. Typhoon Mk IB раннего выпуска с типичной боевой нагрузкой - восемью неуправляемыми ракетами. Хорошо видна потертая окраска самолета - следствие интенсивной эксплуатации Typhoon на малых высотах. 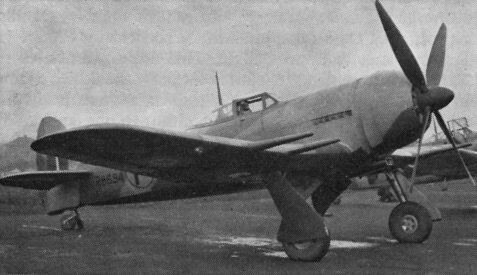 A Typhoon IB to the final production standard, with one-piece, aft-sliding cockpit canopy, faired exhaust stubs, whip aerial, faired cannon barrels and bomb racks. A Typhoon FR Mk IB showing the two wing cannon and camera installation in the inner starboard cannon fairing. A trial installation, by Napier at their Luton test establishment, of annular cowling for the Sabre in an early production Typhoon IB. The one and only Typhoon night fighter showing the AI Mk IV radar aerials on the port wing. The second Tornado prototype was P5224, this picture showing a number of differencies compared with that above, including the forward radiator position, larger rudder, inner wheel well covers, additional windows in the cockpit fairing, and an aerial mast. The third Tornado prototype, HG641, was built to test a Bristol Centaurus installation in the Hawker airframe and led eventually to production of the Tempest II. 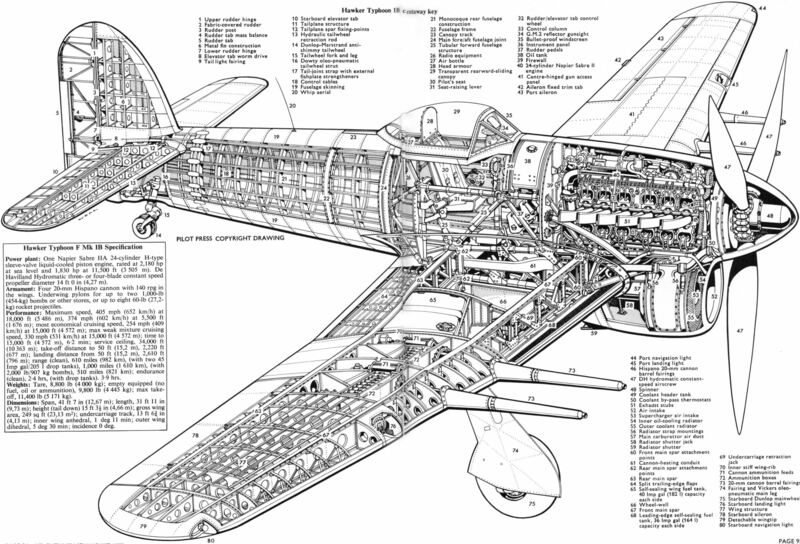 The original installation with 3-blade propeller are illustrated.